I had it all worked out last week, my motivational post was written and then “life” got in the way and I forgot to link my post up with the Linky! It happens, none of us are perfect and occasionally things have to give. It’s my turn to play host this week and I’m looking forward to it, new week, new start and all that. The external pressures are still there but taking the time for me has helped. 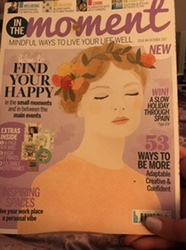 I found the In The Moment magazine in Waitrose a couple of months ago and it instantly appealed to me, I love any tips and hints as to how I can enhance my mindfulness and, whilst learning to crochet has been a mega, mega benefit, having something I can dip it and out of is useful for those – brief but welcomed – uninterrupted bath moments. As well as reading the magazine, I enjoyed reading last week’s links, thank you for such a great range of motivational posts, RaisieBay shared the benefits of her new, fab crutches and Rainbowsaretoobeautiful’s daughter is already considering that she can be King Jane and why not indeed!